Everybody loves kung fu fighting (and karate...and tae kwon do)! 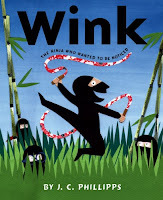 For more junior picks that connect literary arts with martial arts, including an inspiring children's picture book biography of the master Bruce Lee, click here. Oops! I can't let this day go by without sending out happy birthday wishes into the universe for one of my heroes, Mr. Rogers. 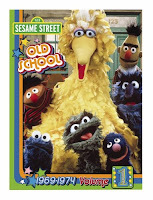 Click on his name to learn 15 things you might not know about this giant of children's television! I watched him as a child and liked him, but it wasn't until I grew up that I really started to understand what a truly rare person he was. Now we have a small shrine in his honor up at the Bookroom. 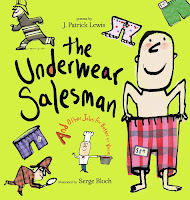 Kids can read about him in the Childhood of Famous Americans series. Don't forget to continue to support his legacy through Family Communications, which also offers many outstanding free resources for parents on-line! We don't always think of him like this, but with the accompaniment of jazz pianist and his dear friend Johnny Costa, he was also an exceptional and accomplished songwriter. He also made music with another friend of his, teacher and puppeteer Josie Carey. I listen to his CD's all the time. His tunes are snappy, inspiring, and just plain wonderful. In honor of his memory, how about a sing-a-long? It's not the things you wear. Not your toys--they're just beside you. It's you. 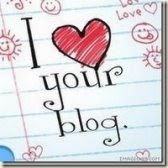 It's you I like. Mister Rogers passed away on February 27th, 2003. We miss you, good neighbor! 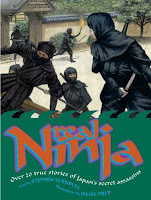 For more heroes, please visit www.biographybreak.com. 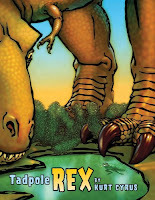 One good dino-book deserves another. 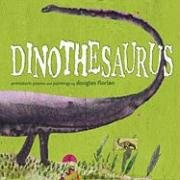 What once was humongous is now just a fossil. Day turns to night in another book using minimum palette for maximum impact, namely, the 2009 Caldecott winner, THE HOUSE IN THE NIGHT by Susan Marie Swanson, illustrated by Beth Krommes (Houghton Mifflin). Scratchboard technique on black elicits the shadows while yellow-orange objects on the pages reassuringly glow like fireflies on the page. The unfettered text inspired by the traditional nursery rhyme "this is the key of the kingdom" is cumulative and winds down perfectly to a cozy bedtime tuck-in. The style of both pictures and text bring to mind the work of Janina Domańska, who won a Caldecott honor in 1971 for IF ALL THE SEA WERE ONE SEA, and likewise, bears reading again and again and again. A dreamy book as warm in spirit as a cozy house. Who would have expected any less, but I have to report that Rosemary Wells certainly rocked the PlanetEsme Bookroom this past week when she came to celebrate her recent release LINCOLN AND HIS BOYS for intermediate readers. 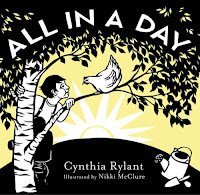 She certainly gave no doubt as to why she is considered legendary in the world of children's books, captivating an audience of over fifty people squeezed in on a Monday afternoon as she shared a fiery and wholly contagious enthusiasm and wildly impressive knowledge of her subject. It was most interesting to hear what really different people they were in the Civil War time period, how "Victorian" in attitude they could be, how things like keeping warm and preparing food and going to school, things we take for granted, were not to be taken for granted back then, and how (as Rosemary put it) "encumbered by prejudice" they were as a generation, and for generations; and yet, out of all of these trials and limitations came forth this amazing man. So, so interesting! 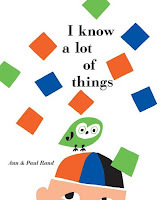 I think everybody there learned something new, and felt something new, too. 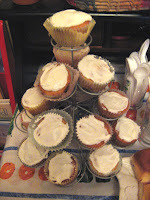 Every party needs some treats, so I served cupcakes using Mary Todd Lincoln's original almond cake recipe (thank you, Sweet Reads) which actually tasted a little funny, kind of like Chinese almond cookies only they were cupcakes...maybe it's because I didn't churn the butter or gather eggs from my own hens, as Mary Todd suggested. I also served up southern corn pudding (to be fair to both sides and bring the union together in honor of our 16th prez), and ham sandwiches, yummy yum if I do say so myself! Rosemary Wells fielded questions with aplomb and here she is giving some serious consideration to the work of a talented young author. My photos are somewhat crummy, pardon me, maybe someone else who was in attendance can share theirs? The Book Stall was our local bookseller for the event (don't forget to support your local independent!) 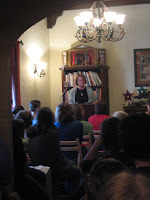 and everyone came away with one of Rosemary's outstanding titles to peruse; my favorite e-mail I received after the event read, "Jesse and I both had a wonderful time listening to Rosemary Wells yesterday. Jesse has barely put the book down since." Well, you know I wish I could just have EVERYONE in my literary living room, but if you couldn't make it, at least you can still vicariously enjoy the experience by "barely putting the book down," and isn't that really the most lasting part, anyway? Thanks for visiting the land of Lincoln, Rosemary Wells! 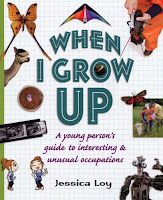 More help from the "help wanted" section, wild and worthy work submitted for consideration even for children who were left behind by No Child Left Behind. I float down an Nile of ink. A while on an isle to think. I shadow blue oceans, green seas. Who measures the world...by degrees. April Fool's Day is just around the corner. Anyone up for a trickster tale? "What took you so long? "Anansi asked. "Where is your costume?" "I didn't know it was a costume party," said Turtle. "You know now. Go home and get a costume." Anansi slammed the door. Knock, knock, knock! Turtle knocked on the door. "Hippity-hop!" Turtle said when Anansi opened it. "Hippity hop! Guess what I am!" "You're a silly-looking turtle pretending to be a bunny," Anansi said. "Where's your dish?" "I told everyone to bring a dish." "You didn't tell me," said Turtle. "I just did. You need a dish. Go home and get one." Anansi slammed the door. 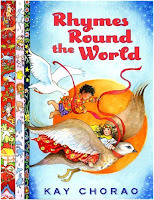 Another lively animal story with folkloric influence. 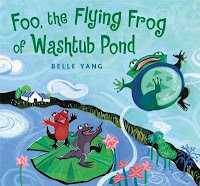 FOO, THE FLYING FROG OF WASHTUB POND by Belle Yang (Candlewick) Foo is bigger than his friends Mao-Mao and Sue-Lin, and so is his ego, leading him to proclaim that he is the biggest animal in the whole wide world! 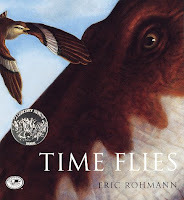 When this boastful toady becomes so filled with hot air that the wind carries him away, he experiences some misadventures with predators that will dramatically change his perspective. Blinking back a tear, Foo replied, "I learned that I am nothing but a very small frog in a very big world." "Foo, you are the perfect size," said Mao-Mao, "for a frog." "Yes, said Sue-Lin, "and you are the perfect size for a friend." 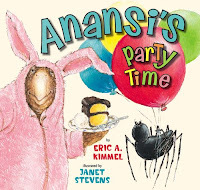 Much better than Anansi's party, I daresay, are the festivities going on this coming Monday, March 16th at 4:30 p.m. at the PlanetEsme Bookroom on the north side of Chicago. We will be featuring a visit by the legendary Rosemary Wells (!!!) 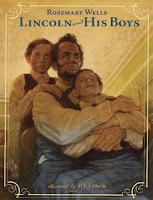 celebrating her recent release LINCOLN AND HIS BOYS for intermediate readers. We're expecting a full house, but in the spirit of children's books, there's always room for one more. If you are in the 'hood and would like to attend, holler at my e-mail. Another one-of-a-kind concept book import, this time from England! There was one little baby who was born far away. There was one little baby who was born in a town. And another who was wrapped in eiderdown. 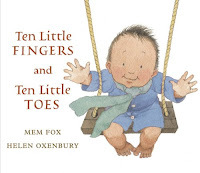 More page-turners for the pre-pre-preschool set. More, more, more, said the baby? Visit Russell's Book Basket. 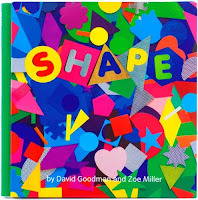 Also, make sure to participate in the utterly splendiferous Share a Story, Shape a Future Blog Tour to discover tons of thoughtful posts that offer helpful hints for a whole childhood of great books and hints for cultivating a lifestyle of family reading! This a really unique internet event that you will not want to miss. Happy birthday to Dr. Seuss, who would have been 105 years old today. 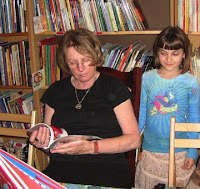 Let loose with a party blower and post your favorite book title by the master of Cat-in-the-Hat disaster at Sally Murphy's Writing for Children blog. Though I loved the whole lot of them as a little girl, the top of my list would have to be THE SNEETCHES, snarky, quotable little riffs on tolerance that stand the test of time, including "Too Many Daves," "What Was I Scared Of" and "The Zax." 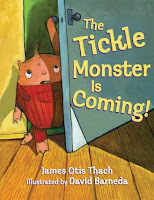 I also love to break out my copy of BARTHOLOMEW AND THE OOBLECK for a wacky spring weather storytime. And for a big, dizzying dose of all things Seussical, don't miss THE 5000 FINGERS OF DR. T, his seriously surreal 1950's foray into motion pictures with a haunting score and some very memorable musical numbers.